Beauty Beyond the Traditions. . .
During this wonderful time of the year, I find myself being thankful for a multitude of blessings. Every morning when I open the shutters it seems there is another colorful blossom to greet me. Although my nasal passages do not approve of the seasonal delights, my other senses are overjoyed. My husband and I have been taking great joy in the brightly colored cardinal who has been frolicking outside our office window. Soon after our cherry tree released its pink blossoms to float like pink snow to the ground, the white azaleas that line our front and backyard bloomed overnight. 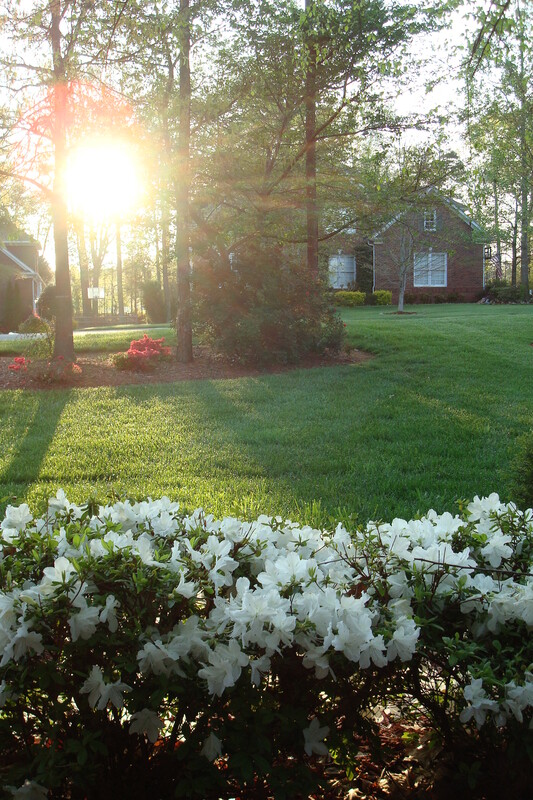 Spring in Charlotte, is definitely a sight to behold. April not only ushers in a time of beautiful flowers and lush green grass, but a time of spiritual renewal and reflection. It is at this time of year that I become especially thankful for the diversity of my friendships and the blessing I receive from viewing this most holy week from two different perspectives. Leading up to Passover, my Jewish friends are busy preparing for company, bringing out special plates and cookware, cooking flourless cakes, making matzoh balls and many other Kosher delights, while setting the stage to reenact a tradition celebrated for thousands of years. In fact, the very same tradition that Jesus, as an observant Jew, repeated at the Last Supper in the upper room. Fortunately, and much to my delight, my Jewish friends have invited me several times to enjoy this amazing feast and celebration. For me, a protestant Christian girl from Oklahoma, having the opportunity to enjoy Passover has made the Old Testament story of the exodus from Egypt leap off the pages (kind of like the difference between seeing a movie in black and white on an 18 inch TV versus viewing it in 3D in an IMAX theater.) Before this experience, my view was more aligned with Cecil B. DeMille’s hollywood version depicted in the motion picture epic “The Ten Commandments.” Experiencing the “several thousand-year old” live version, has been much more impactful and spiritually moving. When I was a little girl (brought up in a non-religious home) this particular weekend was all about that magical morning when I would awaken to find what the Easter bunny had left me. Of course the jelly beans and chocolate bunny propped upon the green crinkled grass delighted me, but it was the stuffed soft furry animal that accompanied the basket that brought me the most joy. As I grew up and began to seek for truth and develop a strong desire to know God, Easter took on a different meaning. I was only about eight years old the first time I saw the movie “The Robe”. In the movie, as Jesus was being nailed to the cross and the Roman guard was gripping his scarlet robe in his arms, my heart was aching causing my eyes to release rivers of guilt and sorrow. Traumatic and emotionally jarring as the scene was to my young psyche, the truth was, the message gripped my soul and I remember at that moment, I was forever changed. Today, my spiritual journey has taken me to an unexpected place of peace and love not ever captured on the big screen or outlined in a few verses of Times New Roman text. Converging two different worlds of man’s story of who God is and all that concept entails, has reduced me to a single human emotion. . .love. . .and for that, once again, I am truly thankful. Happy Spring Awakening to all of you! What a beautiful posting for this season! Thank you for always giving me something to think about!